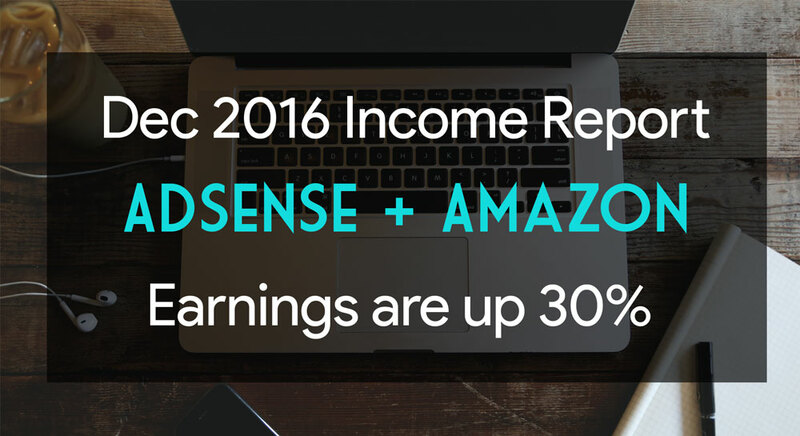 Here I show how much I made on AdSense, Amazon & Affiliate, on my Investment Sites in December 2016. Note that I’ve bought 3 new websites in December, totaling $15051. So my income from investment website went up significantly from $2292.77 earned in November. AdSense is still the king! 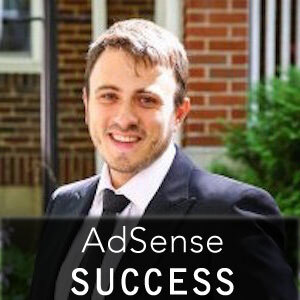 In December, I made $2,222.11 on Adsense alone, which is $567 more than in previous month. This is directly related to adding income from 2 new sites, purchased in the beginning of Dec. However, these new sites together earned $758.03. So technically, my Adsense income is down about $200 for the month. This is primarily due to holidays season’s slow traffic, which normally dips this time of year. As you can see I’ve marked the sites I bought in early December with orange “New Site” titles. One of them is the $10000 investment site that I talked about here. Notice that it earned $677.85 in 25 days. During the previous month (before I bought it) it has made around $325, so I more than doubled it’s income right away. Read my post where discuss the numbers and how I did it. PS, this new $10K site also earns money with an Affiliate program, which I will discuss below. Here is a table of all revenue streams and total. Individual website breakdowns will be below. Here is breakdown by site, including dates when I bought these sites, and how much I made since purchase, on each website. I’m Including 2 new sites in this table. So again there is a small discrepancy (a $6 mistake I made somewhere in calculation totals for this month), but I’m pretty much at $3 grand / months income from investments. However now I’m about $9K down on my Purchase vs Repayment … however I don’t think it will take me long to come back to being even. I was even and even up a few hundred last month, but since I invested $15051 in December alone, it will be few months till I’m in the green again. Investment income outlook for January and 2017 as a whole. So if you look at the sites income breakdown – my best performers are sites number 2 and 4. I exclude Site #3, as it does not earn much (although it paid for itself in 7 months). I have great hopes for 2017. Actually my goal for this year is $10K / month from investment websites, but it will be expensive to achieve 🙂 As I mentioned before, I did just spend $15 grand buying new sites in Dec. Mostly for tax purposes, but also I’m testing new strategy of buying sites on credit! I’m looking at a $28K site right now, but most likely will pass, because I’m pretty tapped out, and want to have some cash reserves on hand. I just finished my first more or less scientific AB Test, and found a clear winning ad size for a specific ad placement. Read how I achieved 138% improvement with split testing. I am now running similar Split Tests on other sites (including site #1). If it results are good, I will replace top 728×90 leaderboard units with 336×280 rectangles on all my sites! Site #2 earned 229% in 14 months. However as I mentioned before – this is a highly seasonal site, so it will be a low-income ($300 or 10% monthly) until April, when income will begin to climb, at should peak at around $1000/month in the July/Aug. Site #4 has earned 98% of its purchase price in 7 months. As of today (Jan 9, 2017) stands at $6592.11 compared to its purchase price of $6700. However, since August, it’s been earning around $1000/month, and continues to grow, so I expect this site to make at least $12K by at 1 year “anniversary”. Site #8 had a great start in first 25 days ($880.85 / $10000). However, first week of 2017 the RPM has decreased significantly, so I’m still concerned with how long it will take to recoup its $10K sale price. However, the traffic is up on the site, and I think drop in RPM in January is temporary effect of advertisers cutting back on spending, after holiday season – typical AdSense behavior this time of year. Site #6 is clearly not doing very well. In 4 months it made only $700 so it was a poor (rush) decision for me to buy this site. However, income and traffic are stable, so I am hoping to recoup investment in 18-24 months, which is Industry standard. Not that this site makes money primarily on Amazon affiliate, so I will need to experiment with product links. Well – I still hope for the best, and wish all a happy new 2017! Keep optimizing and testing. 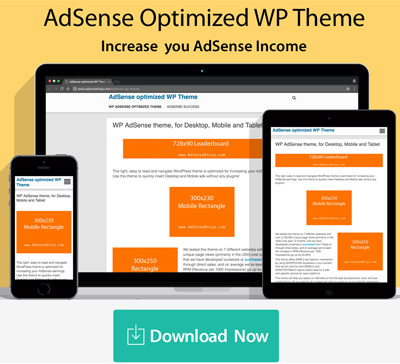 How many visitors do you have on your website(s) to generate this Adsense income? Simone – the more, the better! However, it all depends on a niche. Certain “keywords” pay a lot more than others. However, credit card is a VERY competitive keyword and is very difficult to rank for … and that is where your traffic comes in. If you have 10000 daily visitors to your waterfall website, and average CPC is $0.50, and Click Through Rate (CTR) is 3% you will get 300 clicks per day and make about $150. That would be an RPM of $15 (which I think is a bit high for a “waterfall” type website). By comparison, if you get 100 visits per day to a credit card page, and your CPC is say $7 and CRT is 3% you would make $21 and an RPM of $210 (!) … now your RPM on credit cards is much better, but overall income is low, because of lower traffic. So to answer your question again – the more traffic you have, the better, but it’s also important to be in a “good” niche. 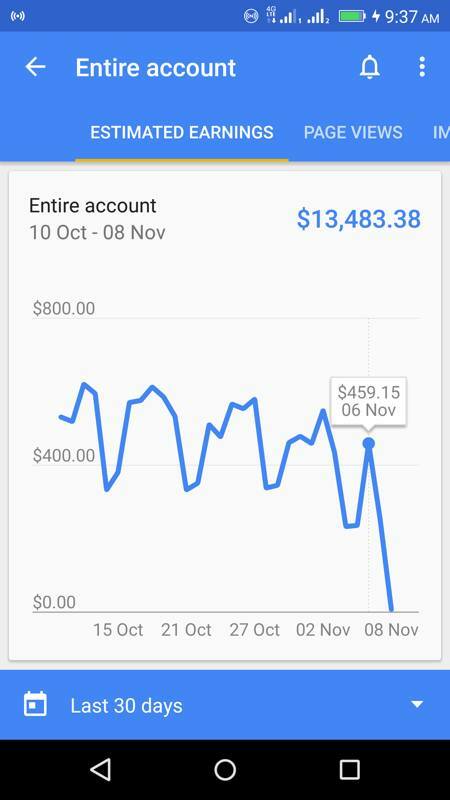 As an example, a client of mine has made $13,483 (that’s USD) in October 2017. He has very low RPM, but had over 20 MILLION page views! I have a site that gets ~250-300 visitors a day, and makes $250-300 a month. I have another site that gets 1000 visits a day, and makes ~$350 a month. So it all depends on your content, CPC, and how well you optimized ads. Then if you grow traffic, your income will grow exponentially. For example if I take 1st site to 1000 visits a day (which is very much attainable), i’ll be making $1000 a month, or 3 times more than my 2nd site, with same traffic.